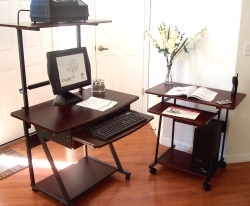 This category comprises compact computer desks of an ideal size, very popular in the office and medical exam rooms as a way of adding a computer workstation in a tight space, as well as at the home-office, and even in the classroom. These are portable computer tables that create a comfortable writing area in addition to efficiently holding a complet desktop computer or laptop, with its peripherals. Neither too wide nor to narrow, these desks fit in any corner. All the carts shown with a tower printer shelf or hutch allow this shelf to be removed. The model STAK47 also includes a 25" wide drawer under the keyboard. The S-003, STK007 & 2936 are height adjustable. Please call us with any questions or for details or to place your order by phone if you prefer. Please click on the image below to see full details, price and shipping cost and/or to order.